Preheat oven to 400 degrees. Place pizza stone in the oven. Place Greek yogurt, self-rising flour and pinch of salt in the bowl of a stand mixer fitted with a dough hook. Run mixer on low for 5-6 minutes, scraping the sides as necessary with a spatula, until a smooth ball of dough has formed. Transfer to a cutting board dusted with flour. Work dough with your hands and press out and pull into a thin circle. Remove pizza stone from the oven and transfer dough to the pizza stone and drizzle with olive oil. Set aside. In a medium non-stick saucepan, heat butter and garlic on medium-high, until butter melts. Whisk in flour and allow to cook, whisking regularly, for 60-90 seconds. Slowly whisk in chicken stock until smooth. Allow to cook 3-4 minutes, continuing to whisk, until thickened. Stir in Parmesan cheese and season with salt and pepper, to taste. Spread sauce on pizza dough. 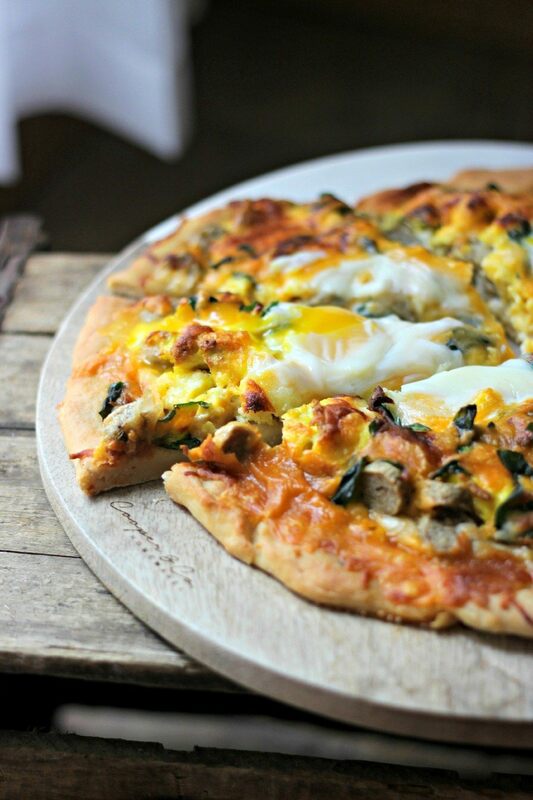 Top pizza with turkey sausage, scrambled eggs, greens and cheeses. Create 2-3 crevices in the toppings and crack eggs into each crevice. Cook pizza for 10-15 minutes, until crust and cheese are browned and egg whites are cooked. Slice and serve.